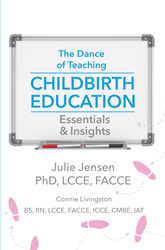 Praeclarus Press has released a new book on teaching childbirth education by Julie Jensen and Connie Livingston. The Dance of Teaching Childbirth Education: Essentials and Insights is a must-have for perinatal practitioners and childbirth educators. Julie Jensen and Connie Livingston provide detailed, evidence-based comfort strategies and unique approaches and considerations to help educators craft top-notch curriculum. The Dance of Teaching Childbirth Education: Essentials and Insights, published by Praeclarus Press, provides specific strategies that empower both the educator and the learner. The Dance of Teaching Childbirth Education: Essentials and Insights Livingston’s last publication before her untimely death. In partnership with Livingston, Jensen provides specific strategies for the different stages of childbirth education—particularly the often-overlooked second stage. Published by Praeclarus Press, The Dance of Teaching Childbirth Education: Essentials and Insights provides detailed, evidence-based comfort strategies to help the educator enhance their teaching. Jensen and Livingston navigate the best strategies to educate the several stages of childbirth. “Your curriculum needs to include anatomy and physiology of late pregnancy to pre-labor: what contractions are, what they do, and examples of how they might feel before using this chart illus¬trating average frequency and duration of the phases of Stage One, and diagrams of Stage Two contractions,” they write. They also make sure to highlight self-care and reflective techniques for the educator. “Balancing your curriculum is not only for optimal learning and engaging individuals, but it should be for us to balance our energy as well,” they share. Praeclarus Press will be in attendance at the International Childbirth Education Association (ICEA) 2018 conference from April 19th to April 21st and will have copies of The Dance of Teaching Childbirth Education: Essentials and Insights on hand. Jensen has been in childbirth education and adult learning fields for over three decades and brings her expertise in writing curricula and teaching to her audiences. Livingston was the found of Perinatal Education Associates, Inc., and the past-president of ICEA. She passed away on December 29, 2016, unexpectedly at the age of 60. The Dance of Teaching Childbirth Education: Essentials and Insights is available at Praeclarus Press and on Amazon.